Beets have so much flavor and color that when they’re the centerpiece of a salad the rest can be quite simple and carry through just fine. That’s how I feel about this simple beet salad, it’s mostly just beets and lettuce and can be whipped up in a minute or two, but I find myself craving the taste of this exact salad every now and then. The beets and lettuce have a nice contrast of texture with one being smooth and the other rough and crunchy. I recommend cutting them up smaller as shown in my picture. As far as the dressing, I have kept it simple and healthy too. It saddens me that people eat salad to lose weight or get healthier and pour on dressings that undermine their efforts and negate the health benefits of all vegetables they just ate. Part of it is that they may not know just how bad those dressings are. Another factor is that also may not know how fast and easy (and fun!) it would be for them to whip up their own healthy dressing. This one has Greek yogurt, lemon and a touch of this and a dash of that.. voila, done. Enjoy and let me know your thoughts. As a kid I hated beets! It’s funny how a reaction or association from age 5 (or even younger) can carry with us for years and years. Even through my twenties I would skip the beets at a salad bar and never even consider ordering them in a dish at a restaurant. About five years ago a friend of mine ordered a smoothie with beets and I had to try it just because of the radiant color. It was wonderful. I tried making a few different dishes with beets and yes, they were wonderful too. It made me think back to the 20+ years that I had passed on this vegetable and how it could have been my buddy all of those years… such regret! Well now is my time to make up for it, so expect to see a number of dishes where beets are the star of the dish or in the supporting cast. Word to the wise, if you hated something as a kid I recommend you try them every now and then just to make sure you still feel the same way. Brussel sprouts are another one that I changed my tune on and wish it had been years ago! Wash Beets. Remove the top and the root of the beets. This looks amazing. My kids love beets thankfully. I am sure that they would love this. I love beets. They are healthy and so is your recipe. Thank You for sharing !! I am sure my diet could benefit from more beets in it. Your salad looks delicious, the bright color looks amazing. My mom always added some sugar beets in her potato salad and it tastes wonderful! I would love to give your recipe a try. I love beets! This salad looks so yummy, I”m gonna try it soon. I’m crazy now actually for Japanese dressing with roasted sesame, I think it will work with this salad too. Healthy and delicious! I would love to try the yogurt dressing. Thanks for the recipe. Looks really delicious, my mother in law makes similar salad. Thanks for the recipe. YUMM! That looks really good. We aren’t a big fan of beets but we’ve had a few really good beet dishes lately so we’re starting to come around. The color is absolutely amazing on this salad! I can’t believe how it pops so beautifully. If it tastes half as good as it looks then what a hit! What a gorgeous and healthy salad! I love the combination of ingredients and your beetroot really pops in the photo to me! Oh you know, I am so sorry, I just have never liked beets, but I suppose maybe it was all in how it was cooked. The way I had it growing up was from a can. But maybe adulthood has changed my sense of taste and I could give them another try. I’ve never been a big fan of beets, but this actually looks pretty delicious. I think I’d be willing to give them a try again. This is what I want right now. Drooling over this salad veggies. Love it. I love salad, this one look something new in my eye. I wanna grab this yummy lettuce salad lol. This salad looks so pretty and colorful you just want to take a bite. Not being a big beet eater, I’d be willing to give this a try. Yum! That looks so good and it is so pretty, too! I will definitely be making this recipe! This salad looks tasty and refreshing. I have never tried adding beets to my salad. I need to try this. I have never tried a beet salad. It looks so pretty! With how hot it is here I don’t want to turn on the oven, I might need to try this! This is so weird, my mom actually mentioned this weekend that she wanted to try including beets back into her diet and she thought a salad would be the best way, I am so sending her this post! That salad really looks good. I like the colors coming from the meal. It makes it eye appealing. I bet it taste great too. I’ve never been a big fan of beets, but I do think you are going to make a believer out of me. Your salad is simply beautiful! That sounds delicious. 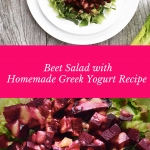 We eat a lot of beets down here, but I’ve never thought of having them with yogurt before. Yum. To be honest I normally would eat something like this but your pictures are really tempting me! I’m so trying it. This sounds so yum. Thank you for sharing. Beets certainly add a fabulous color to a dish, but I just haven’t really been able to warm up to them myself. I am curious to see how this tastes with the yogurt. What a gorgeous salad! I definitely want to try the yogurt dressing. It’s ingredients that I love! I’m going to try beets again and see if I like them now. I always had them from a can growing up and that really grossed me out. This is a great looking recipe. I love the burst of color plus the healthy yumminess it offers. I love sugar beets and I will be making this dish for my family too. I love beets, they just gorgoepus and delicious! I’ll bet this salad tastes amazing! Not a fan of beets but your salad looks amazing! I bet it taste heavenly! Your salad looks delicious, I haven’t had beets since I was a kid! I remember fighting my mom to eat them. I grew some beets this Summer in my garden. Now I know what I can do with them. I haven’t tried too many recipes yet that use beets but this sounds interesting! Can’t wait to try the recipe! That looks vibrant and very appealing. I have never tried making anything with beet but would love to try. I love lettuce, but I’ve never tried it with beets. My husband is a beets lover though. I bet he would be delighted to see that. I am normally not a HUGE beet fan but I can honestly say that that salad looks gorgeous!! YUM! YUM! I wish I had this salad last year when we had an overabundance of beets in our garden. We boiled and canned and we pickled and canned. They really are a great vegetable and pair well with many things. I bet that is really healthy. I have heard that the more color that there is in your salad the healthier it is. That one looks quite colorful, indeed. I bet it tastes amazing too! That looks positively mouth watering! I think I need to run out for the ingredients so I can make this for dinner tonight! I have never tried a salad like this before. It looks so delicious. I will have to try it this week. I love the colors of this salad. I was never a huge fan of beets until my mom made them roasted and drizzled with butter. This salad looks really yummy. I’ve never had beets before so I’m not exactly sure if I would like them. Worth a try though. what an interesting salad! I never had a salad with yogurt dressing Im sure its good! This looks awesome but I am sorry I think I couldn’t eat this. The salad doesn’t look familiar to me. So I guess I pass. This looks like a delicious salad! I am always looking for new ways to dress up my salads! This looks like such a delicious salad. I love the colors too!